Literacy is the ability to read and write well. You and the school share responsibility for your child’s language and literacy learning. Collaborate with your school to make decisions about your child’s literacy education right from the start. Your child benefits when you and the school work together to support her literacy development. Working together promotes faster development and catches trouble spots early. Ask the school how you can communicate with each other. Find out how you will receive communication from the school and ask questions if you need more information. Tools to help your child read and write may be available. Tools for reading include audio books, screen readers, speed control tape recorders, and devices that can scan printed material to be read aloud. Tools for writing include special keyboards, speech recognition software, proofreading software, and pens that record someone speaking. Try out different activities and tools and share with the school what worked well and what did not. Explain your role in the activity. Let the school know if you or your child need more information or support. Discuss other ways your child can practice the skills learned at school, such as at the library or through literacy services in your community. Take time to understand the school’s position and openly communicate your view. Work together to find a solution to address your child’s learning needs that you both can support. If you and the school disagree, get advice from others on next steps. Epstein, J.L. (2013). Summary: School, family, and community partnerships to improve students’ reading and literacy skills and attitudes. In B.W. Toso (Ed. ), Proceedings of the 22nd National Conference on Family Literacy 2013 Research Strand (pp. 15-22). University Park: PA.
Hall, S.L. & Moats, L.C. (2002). Parenting a struggling reader: A guide to diagnosing and finding help for your child’s reading difficulties. New York, NY: Broadway Books. Henderson, A.T., & Mapp, K.L. (2002). A new wave of evidence: The impact of school, family, and community connections on student achievement. Austin, TX: National Center for Family & Community Connections with Schools, Southwest Educational Development Laboratory. You and the school share responsibility for your child’s language and literacy learning. 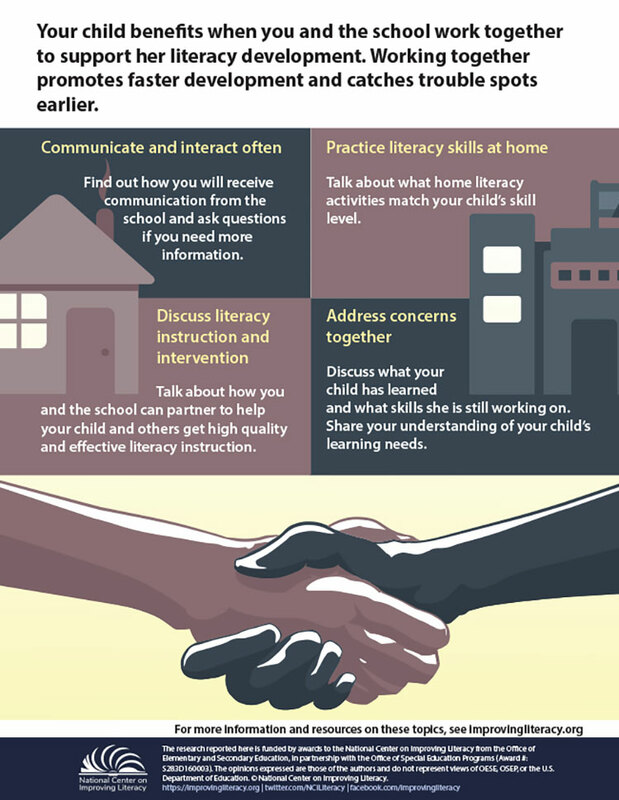 Collaborate with your school to make decisions about your child’s literacy education right from the start. Your child benefits when you and the school work together to support her literacy development. Working together promotes faster development and catches trouble spots early. Find information about what to expect through the grades and possible topics to discuss and questions to ask your child's teacher. Wondering when to call your child's teacher? Read about situations where parent contact is appropriate and even encouraged. There are many people at your child's school who are there to help your child learn, grow socially and emotionally, and navigate the school environment. Read a selected list of who's who at your school: the teaching and administrative staff as well as organizations at the district level. My Child is Struggling with Reading, What Do I Do? Read an information sheet that explains the steps a family can take when a child is struggling to read.